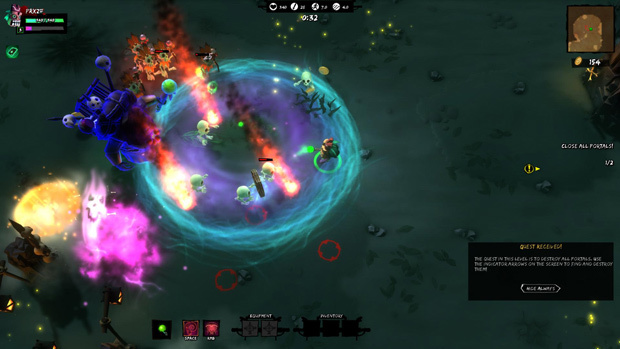 MMO MMORPG News·Editorial·Full Mojo Rampage Review – Do You Even Voodoo? Full Mojo Rampage Review – Do You Even Voodoo? There are a lot of really good games around the net, unfortunately many of them do not have the budget or the tools to advertise themselves and thus no one finds these beautiful diamonds drowning in a sea of stones. 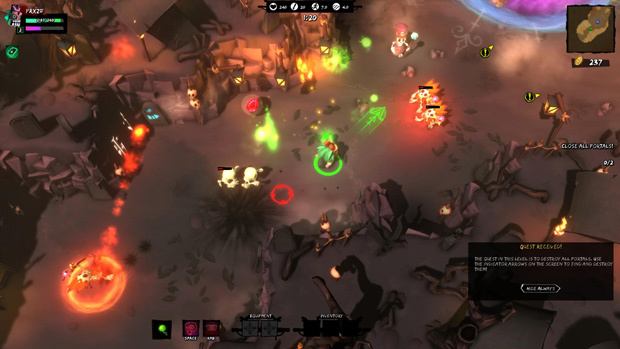 I came across Full Mojo Rampage, a rogue-like game that takes voodoo to a whole new level. 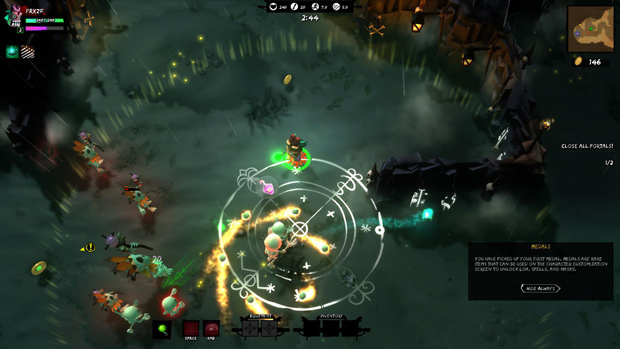 In this game you will have to use your powers and spells to bring down any foe that crosses your path, clear the objectives and survive to the next level. If you can’t take the heat, get ready to start all over again after a humiliating defeat. This game is brutal, for a rogue-like game it actually is incredibly hard right off the bat. Go in gritting your teeth with white knuckles cause the learning curve just isn’t present. For those not familiar with the new gaming genre term ‘rogue-like,’ there’s a few key features that can define it. 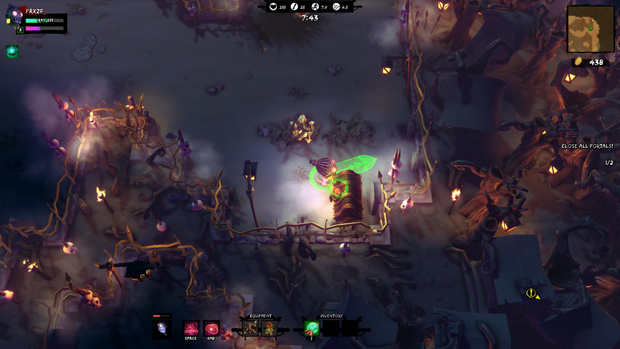 Permanent death is one of them, and in Full Mojo Rampage it is unfortunately a thing that you will encounter a lot. However if you can push back the onslaught long enough to take in the sights, you’ll be impressed by just how beautiful and stylized the world around you is. 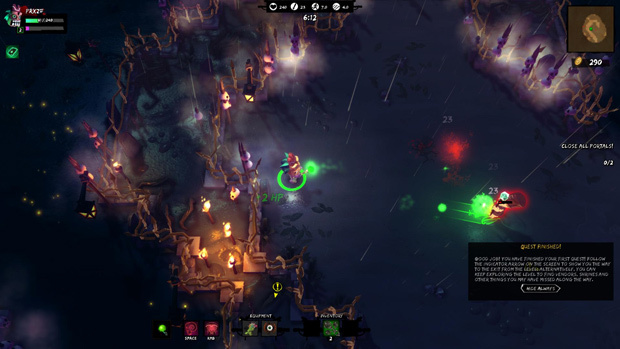 It’s best to only gape at the scenario in the online or local multiplayer mode though, as the difficulty scaling still seems to favor teams over soloists. Besides the quests there are also daily quests and challenges that you can play as a competition against others. Each quest typically involves completing a set number of levels. Since permanent death is a huge thing in Full Mojo Rampage, they have upped the ante and randomly generated each level, so you won’t even have the advantage of replaying the same map to improve by memory. When I started playing this game, I must’ve done the first few levels in a quest a billion times, but the entire time the levels never even remotely looked alike. New traps and treasures awaited me in various locales each play through. So you do not have to worry about facing the same challenge twice, unfortunately that also means that there are a lot of more challenges waiting for you that want to kill you. In this magical world you will take control of a character and dress him up with a mask to distinguish yourself from the voodoo crowd. These masks are purely cosmetic but there are still a lot of them that you can unlock with Medals. Medals can be found in the game by completing objectives and killing monsters. When making your character you can also make them use different voodoo pins; these pins can be found in-game and can also be leveled up to make them better. You should see them as extra attributes to make your character hit harder or shoot faster. And the last thing that you can give them is their parent god, and this basically defines what the character is capable off and what skills they can unleash. Their parent god is the closest thing in Full Mojo Rampage to a class system essentially. Each one of these parent gods can be unlocked with 10 medals, so you will have to save up before you can play as something else. In addition to treasures and traps being randomly placed throughout levels, there’s certain random events that may pop up to really shake up your experience. To complete a level you will have to do the objectives that are given to you at the start. Usually it makes you clear portals in the first couple of levels but there are a lot of other events that you’ll need to clear to reach the exit. When you have done all of the events, the exit will open a portal to safety. Those who think they can recklessly rush to the exit though will be in for a nasty surprise when the exit closes to block nearby evil foes from getting through. As expected from this type of game, the loot is your primary goal. Treasure chests contain a variety of items including coins, health boosts, equipment and other supporting items that can also be found as drops from monsters. An interesting piece of loot is the staves. Each staff unlocks new abilities for a limited number of uses based on an energy bar. Once out of energy, these super staves will break and return you to your standard weapon set, so feel free to go hog wild and blast some baddies in the meantime. You can also find mojo dolls and other similar voodoo items that offer stat boosts and can be mixed together to create stronger items. Just keep in mind that one misstep and you’ll die, losing all these items and equipment in the process. Death isn’t the true end though, as your coins and medals will stay bound to your account. So will your character level, so you will always get stronger if you are stuck repeating a quest act. My first playthrough was rough. In the first couple of hours I didn’t get too far as I was rushing through the levels without proper precaution. Full Mojo Rampage is quite a challenge and knowing your character’s limits is key to living long enough to progress. The huge variety of challenges you will face as you take on the reworked levels repeatedly helps offset the frustration of the permadeath. Honestly to the point that I can say Full Mojo Rampage is perhaps the best game in its genre. If you don’t mind a challenge, and are tired of completing games without any real difficulty to them, then hurry up and snag an unlock key from our giveaway page while they last. I guarantee every minute you play will be tons of fun.